Mrs. Bertha Williams was born on July 9th 1923, in Beaulieu, St. George’s, Grenada in the British West Indies. She was the daughter of Fedora and Richardson Andrews, with three sisters, Violet, Verna and Ivy, and two brothers Joseph and Ben. She is the last surviving person of that family, losing her sister Violet a year ago. 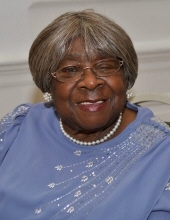 Ms. Williams went to be with the Lord on Saturday April 13th 2019. She had very fond memories of her childhood and young adult life and also sad memories, because of the loss of her mother and siblings. She was a teacher for many years and she will always be referred to as Teacher Bertha. She was married to Robert Williams, a sweet and gentle man, and had seven children from that union, losing one young infant to pneumonia. As a young woman she was involved in community activities and did many charitable works, as she reached out to those whom she recognized as needing help. Bertha Williams emigrated to the United States of America and her family later joined her. She worked diligently and retired to a quiet life. She was a strong, kind and loving woman and will always be our shining star. Ms. Williams leaves behind many who will always cherish her memory. Too many to mention. They include her children: Mary (Gene), Bob, George, Benedict, Ann and Rose. Her grandchildren: Keron, Raquel, Thaddeus, Abigail, Nickolas, Robert Michael, Brandon, Angelina, Duffy, Dee, Trina, Chris, Richard, Tamara, Nadia, Tashi, Aaron, Crispin, Tiffany (David), Mary Kathleen. Her great grandchildren: Sidney, David, Julian, Tristan, Justin, Francesca, Amelia, Richard Jr., Martina, Elijah, Robert, Tianna, Naomi, Joshua, Shanice, Anthony, Andell, Anderson, Solange, Joseph, Jonathan, Dayana and more. This Online Memorial has been created to commemorate the life of Bertha Williams. Leave a message on the Tribute Wall to share your favorite memories and offer words of sympathy and comfort. To send flowers or a remembrance gift to the family of Bertha Williams, please visit our Tribute Store. "Email Address" would like to share the life celebration of Bertha Williams. Click on the "link" to go to share a favorite memory or leave a condolence message for the family.